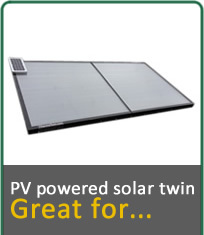 PV panels utilise both forms of solar energy; solar thermal and photovoltaic. The solar thermal section of the panel is able to provide the vast majority of a dwellings hot water while the photovoltaic section harnesses the suns energy to power the pumping station. As a result little or no electricity is required from the dwelling to pump the fluid around the hot water system. The other great benefit that these panels have is that they are designed to be retro-fitted to gravity fed hot water systems. In the case of other solar panel solutions a a new un-vented solar hot water cylinder is required. This solution can also be converted to operate on un-vented systems making the panels incredibly versatile for a wider range of energy users.